Rising gas prices are crimping household budgets across the country. In the past two weeks alone, gas has jumped at least 12 cents per gallon. 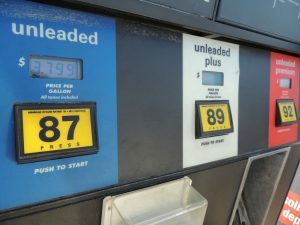 Over the past year, the national average price of gas has increased by 31 percent, according to reports on GasBuddy.com. With that increase, drivers will end up paying $1 billion more for gas this Memorial Day weekend than they did last year. According to AAA, Americans are now paying an average of $2.97 a gallon. Fifteen states have average prices that are $3 per gallon or higher. Prices can differ widely from state to state. Gas in California and Hawaii averages slightly higher than $3.70 a gallon. A gas station in New York City at least briefly sold gas at $4.99 per gallon. Prices at the pump haven’t been this high around Memorial Day since 2014. The price spike also comes at a time when record numbers of Americans are hitting the road for the holiday. There are an estimated 36 million Americans planning on traveling by car this Memorial Day weekend, a nearly 5 percent increase over last year. Overall, about 41.5 million Americans will travel by car, planes, trains, buses and cruise ships over the 4-day holiday period, the highest since 2005. There are several reasons why prices at the pump are getting so high. The first is that the United States is consuming more gasoline, thanks to the strong economy. Another is that less oil is available as OPEC teamed up with Russia to slash production beginning in early 2017 to boost falling prices. The strategy eventually worked to end a supply glut and global oil stockpiles have been falling, making oil more valuable. Brent crude, the global benchmark, is up about 50 percent over the past year, recently rising past $80 a barrel. Now, nations are imploring OPEC and Russia to supply more oil to world markets to calm the market down. OPEC and Russia are next due to meet on the matter in Vienna on June 22. U.S. oil prices also spiked when President Trump announced the United States was withdrawing from the Iran nuclear deal earlier this month. Renewed sanctions on Iran, the world’s fifth-biggest oil producer, could take as much as 1 million barrels per day off of the world market. While it is yet unclear how much of Iran’s oil production will be sidelined, high global demand and shrinking global supply is likely to keep oil prices elevated for the near future.